April 20, 2015. 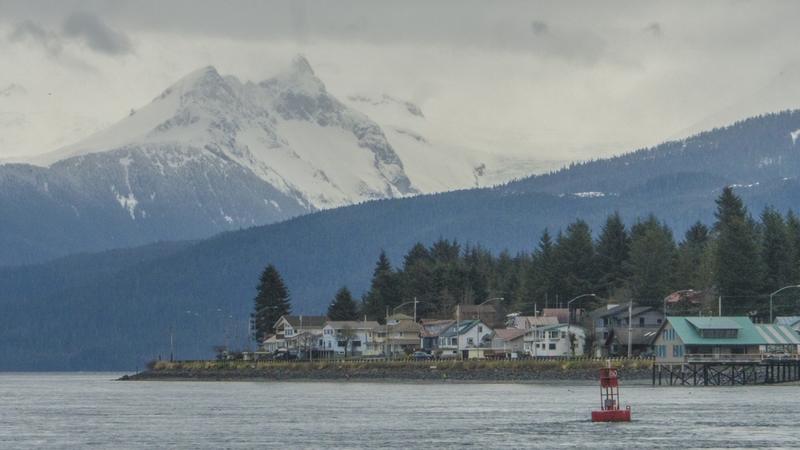 Vancouver Island to Juneau. During the winter of 2014/15 Venture was outfitted with the latest electronics and a new anchor windlass after the original was beginning to show its age following ten years of hard use. 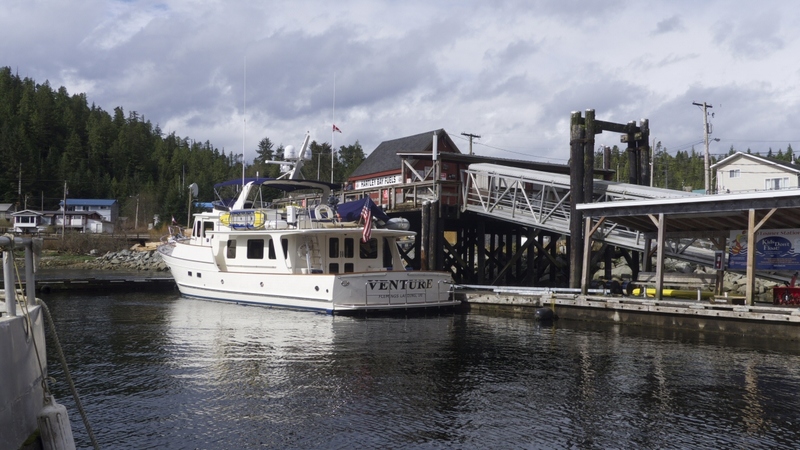 Following a quick trip to Seattle to show the flag at the boat show, Venture returned to Delta Marine Services and was made ready for our departure on April 8th. We are setting off early this year because we have ambitions to visit Dutch Harbor in the Aleutian Islands and the Pribilof Islands 200 miles north of there in the Barents Sea. How much we actually achieve will of course depend on the weather gods. Apart from myself and Venture's longterm captain, Chris Conklin, we are accompanied by Christine Edwards who has been aboard on many trips and also by Scott and Jasi. 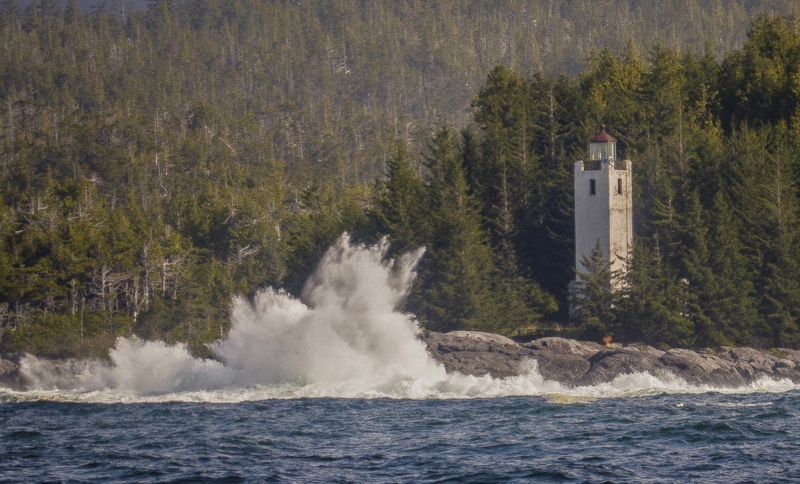 After an overnight stop at Hornsby Island, a favorable six knot current propels us through Seymour Narrows at sixteen knots. 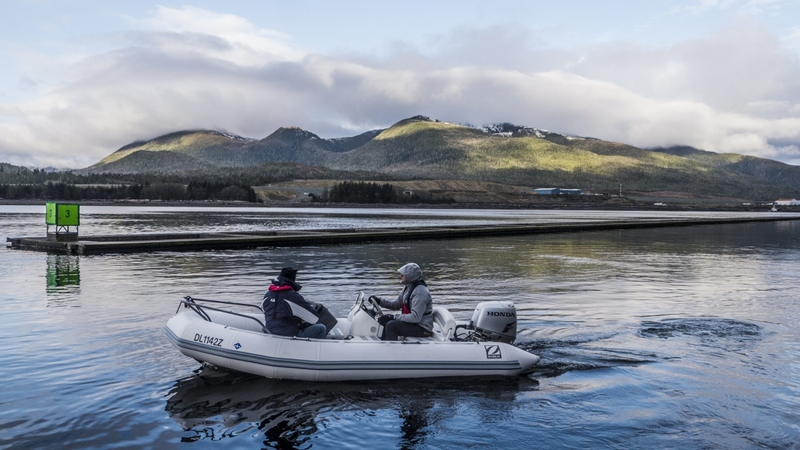 We continue up Johnston Strait to Port McNeill and the North Island Marina where, this early in the season, we are the only transient pleasure boat. We are greeted on the dock by the proprietor, Bruce Jackman, who generously insists on taking us to dinner at a local sushi restaurant. 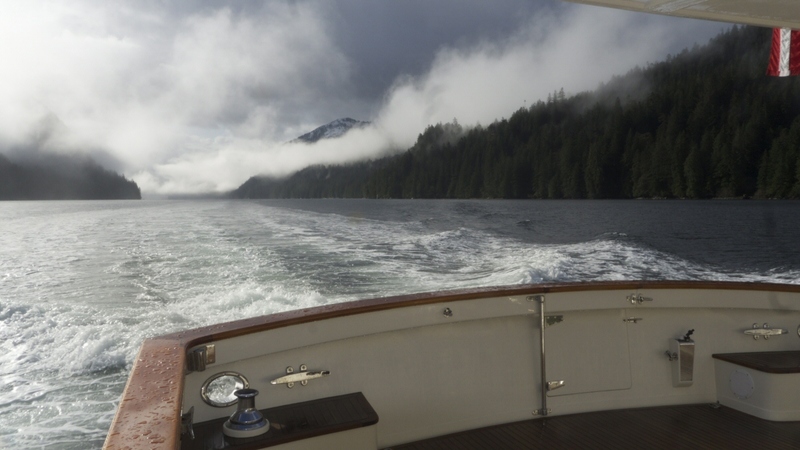 The weather forecast is a bit iffy but we decide to tackle Queen Charlotte Strait and evaluate Queen Charlotte Sound with a back up plan to duck into Bull Harbor should conditions look bad. In the event the dire predictions prove unwarranted and we make our way past Pine Island and Cape Caution into Fitz Hugh Sound. We feel our way into Fifer Cove on Blair Island and prepare to drop the anchor but, after a token hiccup, our brand new windlass goes on strike and refuses to budge. We have no choice but to find a dock at which to moor. After consulting our indispensable Douglass guide we reverse course and head to Duncan's Landing ninety minutes away. We arrive as the last of the daylight drains from the sky. 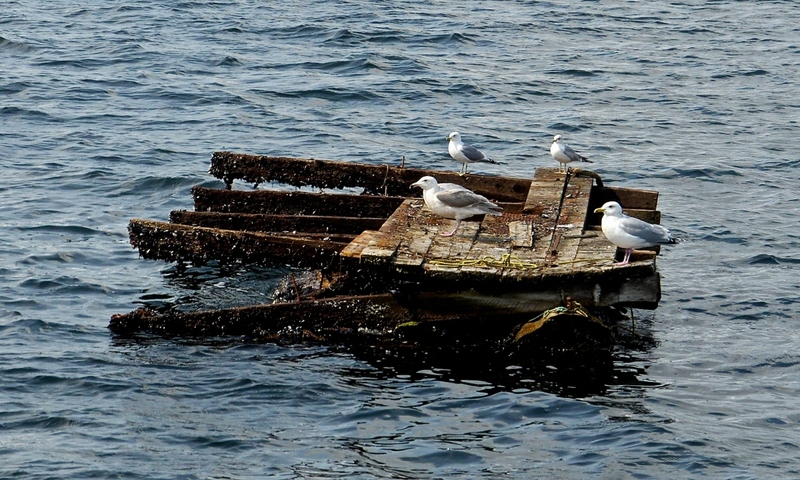 The docks have yet to be deployed for the season but in the gloaming we find a spot to tie up. A lone watchman and his dog appear and give us the OK spend the night. It is raining the following morning but there is clear evidence that snow had fallen during the night. Shielded by an umbrella Chris removes the cover from the windlass motor and determines the problem to be either in the windlass motor or the control solenoid. Using our new satellite phone, we call Brian at Delta who offers to send technician to meet us bringing with him the motor and solenoid from the retired windlass. 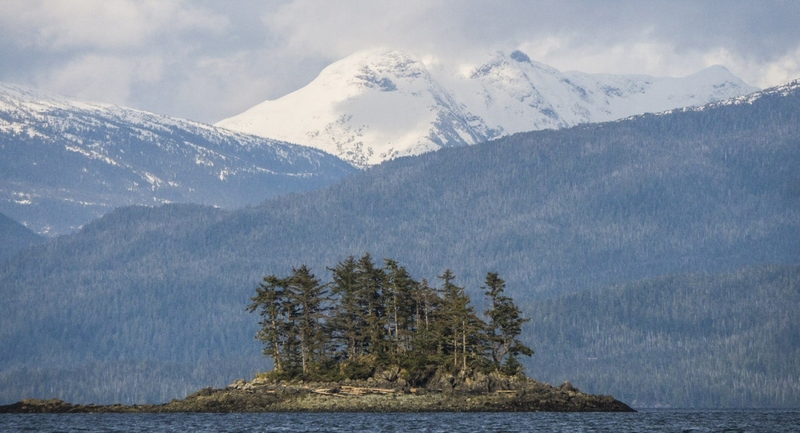 After considering various alternatives we decide on Prince Rupert as being the best location for the rendezvous but this is still two days away and, as we are unable to drop the anchor without considerable effort retrieving it, we need to find a dock. e use the time to reconnoiter the village and meet up with some people from Quebec who are here to construct new houses. It was just around the corner from here that, in March 2006, the BC ferry Queen of the North ran aground and sank in the middle of the night. There is a plaque commemorating the assistance provided by the people from Hartley Bay. 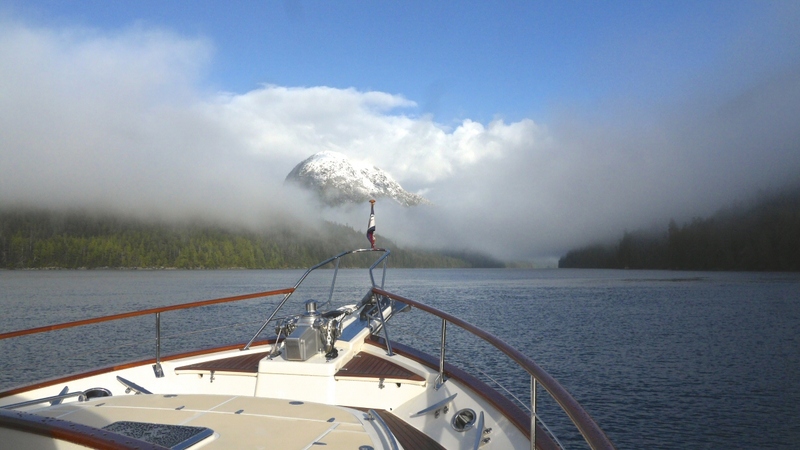 The following day we head up Grenville Channel and reach Prince Rupert without further incident. We are allocated a berth at the Prince Rupert Rowing and Yacht Club in Cow Bay. The next morning Kevin arrives from Delta Marine services but sadly the same cannot not be said of the all-important motor and solenoid which the airline has left sitting on the ground in Vancouver. The day is spent re-checking everything and taking care of some other issues involving the new equipment. Finally the missing parts are delivered at 9.15 pm and installed within an hour. The old motor lacks the gleaming finish of the new but turns the windlass like a champ. The following morning Kevin returns home while we head for Dickson Entrance where we cross the border back into the US and arrive in Ketchikan. The town is very different from our previous visits. For one thing it is not raining and we are here ahead of the cruise ships which normally tower over the town like floating apartment blocks. During the season up to five of these behemoths dock here every day but the first of this year's crop is not due until May 1st - two weeks hence. We check in with customs and immigration and a very nice lady visits the boat to check passports and other formalities. We are now back in the US and our US phones feel more at home. Unfortunately Scott has to leave us here because the person he had arranged to stand in for him while he was away has reneged on his commitment. 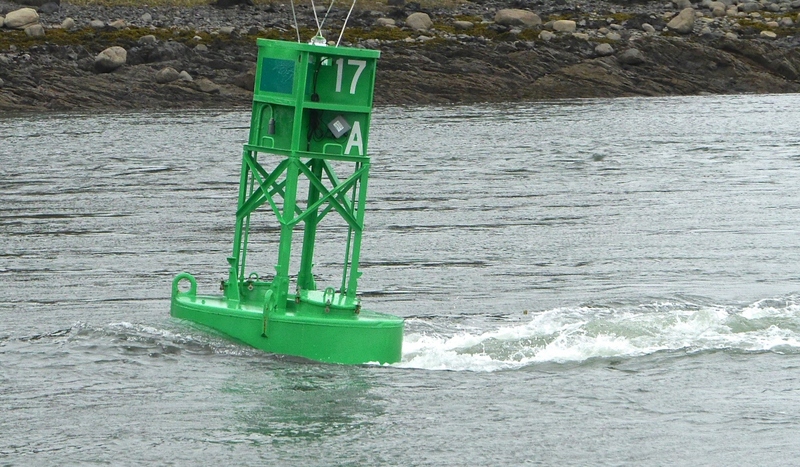 Ketchikan airport is located on an island and Chris ran Scott across to the airport in the tender. We are underway before noon with the intention of stopping for the night at Myers Chuck but decide to keep going in the interests of making up for the time lost due to the windlass problem and spend the night at Exchange Cove on Exchange Island where we anchor for the first time on this trip. The tide is low and we watch in vain for bears foraging along shore. The next day we cross Sumner Strait en route for Wrangell Narrows. The wind gusts to over 30 kts but fortunately it is from aft. Strong currents in the strait tussle with those from the Narrows and sheets of spray deluge the boat. The tide enters the narrows from both ends and initially we have the current in our favor but it turns against us as we approach Petersburg where the aptly named Devil's Thumb rises beyond the town. We had planned to stop here but, once again, decide to press on to make our Northing. We see our first floating ice, from the Le Conte glacier, barely visible through binoculars against the distant shore. 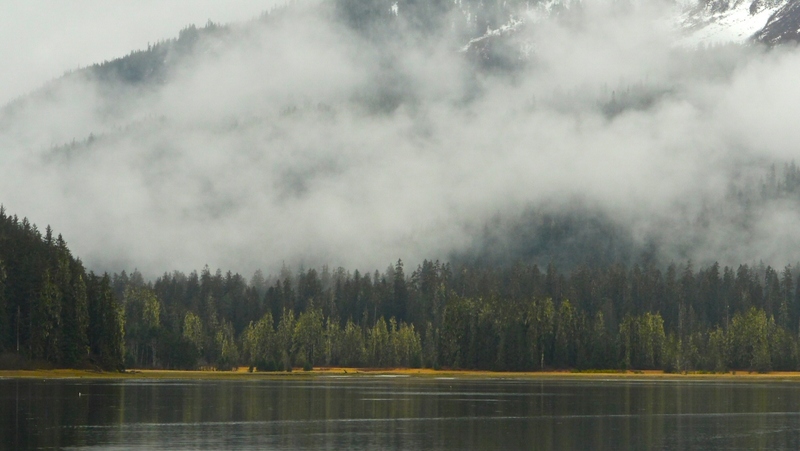 In the open waters of Frederick Sound we find ourselves in an all grey seascape. 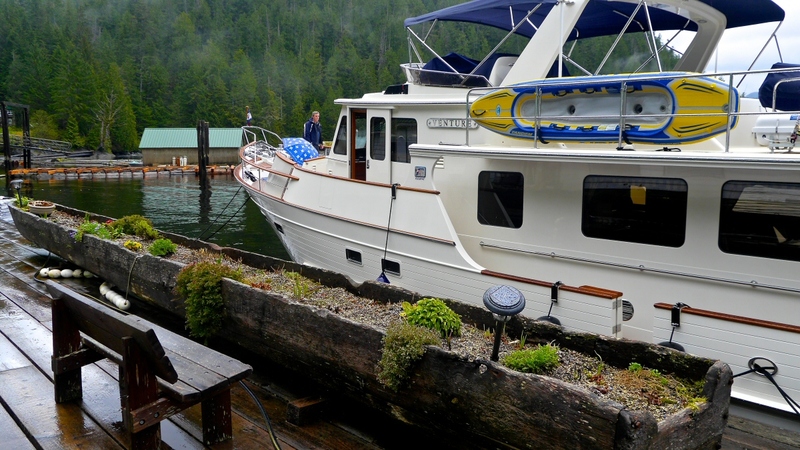 We anchor for the night in Snug Harbor on Admiralty Island. 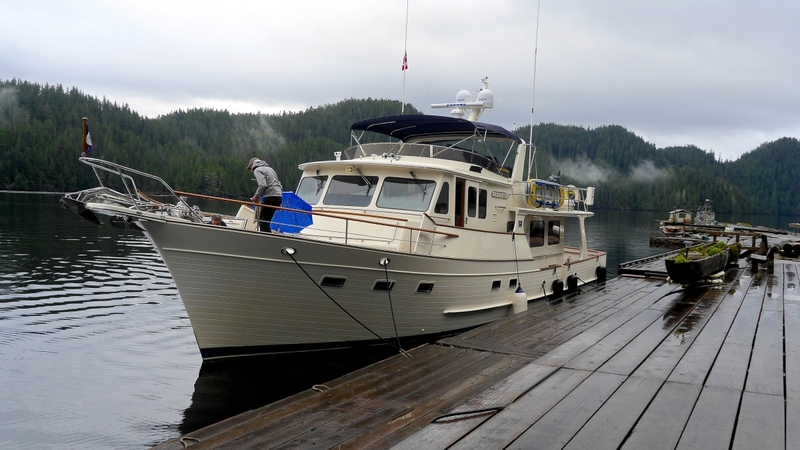 The following morning we set off up Stevens Passage and Seymour Canal to Pack Creek off Windfall Harbor in the hope of seeing bears. This is a official viewing area and special permits are required from June 1st and usually booked out weeks in advance. We see some beautiful scenery but alas no bears - nor anyone else. From here we shoot for Holkum Bay with plans to anchor in No Name Bay at the entrance to Tracy Arm but the forecast is for strong south easterlies which could blow errant ice into the bay so we decide to continue on to Taku. We have numerous sightings of whales today but nothing dramatic or close to the boat. 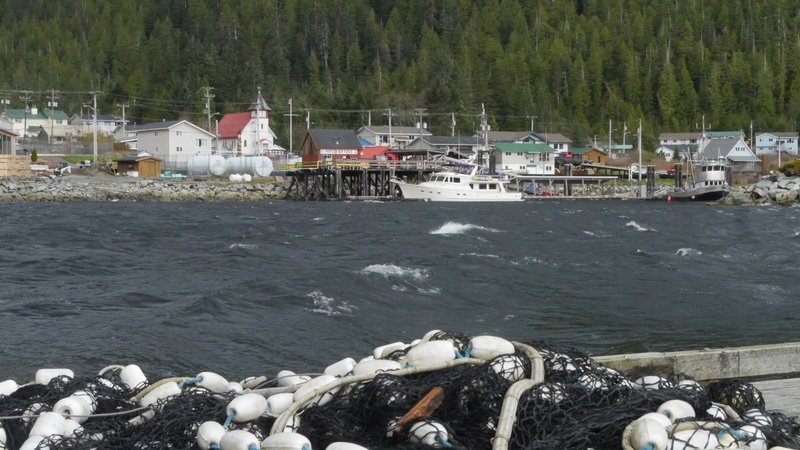 The tide is extra low when we arrive in Taku and the pilings supporting the docks reach for the sky and seem excessively long but, during the night the water will rise 24 ft. When we awake in the morning it will be even lower than when we arrive. 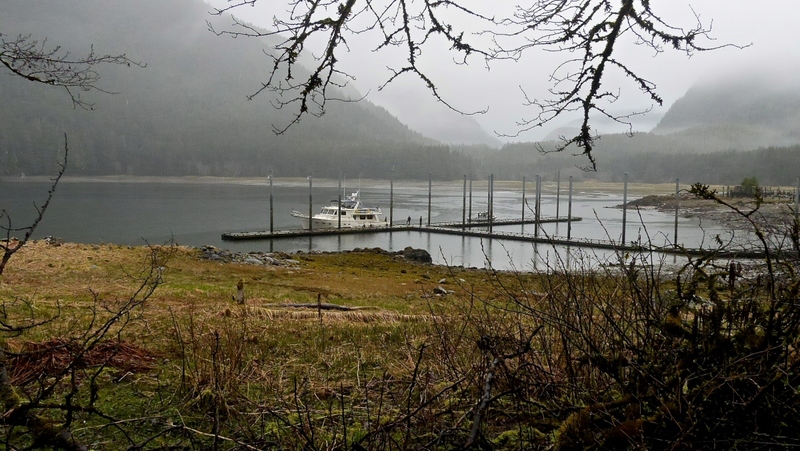 During the summer the limited docks are crowded and space is at a premium but today we have them to ourselves until an Alaskan State Troopers boat pays a brief visit to check out a cabin on the shore. 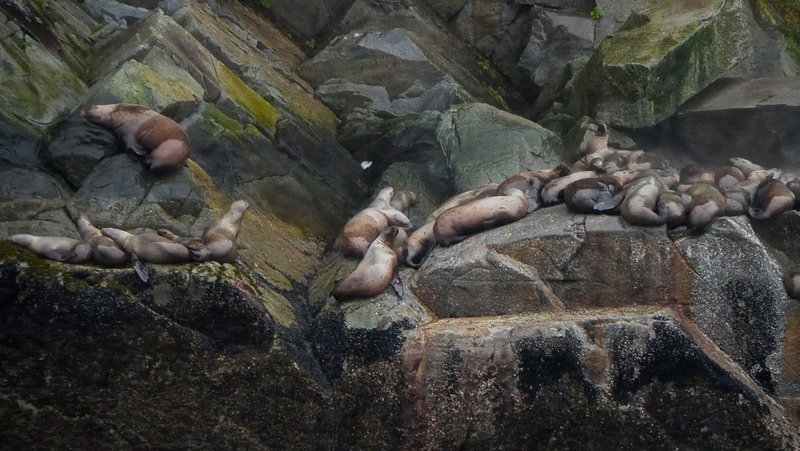 Juneau is just forty miles distant and we stop by a seal haul-out on our way. As with Ketchikan it is strange to see the town without any cruise ships. We are allocated a berth in the heart of downtown. Usually these are very expensive but this early in the season they are priced the same as the more distant berths which are currently undergoing major reconstruction. 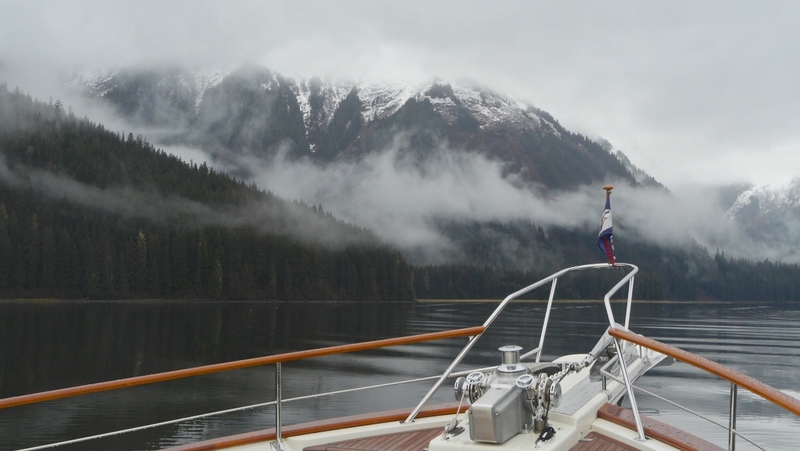 While here, we will take on fuel and provisions before we brave the Gulf of Alaska on our way to Cordova in Prince William Sound.